Description. This species is one of the largest bats in Washington and features a heavy body, large head, and broad nose (Kurta and Baker 1990, Nagorsen and Brigham 1993). The pelage varies from pale to dark brown, is darker above and lighter below, and has an oily texture. Individual hairs on the back are relatively long (>10 mm) and extend one-quarter of the way down the upper surface of the tail membrane. Wing membranes and ears are black. Ears are relatively rounded and short, and barely reach the nose when pressed forward. The tragus is also short and blunt. The foot is large and about half the length of the tibia, and the calcar has a prominent keel. Taxonomy. Twelve subspecies are recognized (Simmons 2005), with only E. f. bernardinus confirmed in Washington. A second subspecies, E. f. pallidus, may extend into extreme eastern Washington (Hall 1981). Distribution. Big brown bats range from southern and central Canada to northern South America and the Caribbean (Kurta and Baker 1990; Appendix A). This species is present throughout Washington (WDFW WSDM database). Population status. This species is common in many parts of its range, but information on population size and trend is generally lacking. Whitaker and Gummer (2000) suggested that abundance in northern populations has perhaps expanded over time with the increased availability of heated buildings for hibernacula. In Washington, big brown bats have been found at nearly every location where surveys have been conducted (Johnson and Cassidy 1997). Detections were common or moderately common during acoustic or capture surveys at various sites in the eastern and western Cascades (Thomas 1988, Erickson 1993, Taylor 1999, Christophersen and Kuntz 2000, Baker and Lacki 2004), Moses Coulee (Fleckenstein 2000, Rosier and Rosenberg 2006), Hanford (Gitzen et al. 2002), Turnbull National Wildlife Refuge in Spokane County (Rancourt et al. 2007), and the general areas around Olympia in Thurston County and Joint Base Lewis-McChord in Pierce County (Wunder et al. 1992, Falxa 2005, 2008a; G. Falxa, pers. comm.). In contrast, detections were infrequent or not made at other locations in the western Cascades (West et al. 1984, Thomas 1988, Petterson 2001), the Selkirk Mountains (Campbell 1993), at the Yakima Training Center (Christy et al. 1995), Hanford (Lindsey et al. 2012), Badger Gulch in Klickitat County (Fleckenstein 2001a), in the San Juan Islands (Dalquest 1940), and on the Olympic Peninsula (Erickson et al. 1998, Jenkins et al. 1999, West et al. 2004). Habitat. The big brown bat is a habitat generalist that occupies a variety of forest types, rangeland, and urban areas (Whitaker et al. 1977, 1981a, Nagorsen and Brigham 1993, Johnson and Cassidy 1997, Adams 2003). In Washington and Oregon, the species appears to be more common in forest than shrub-steppe and alpine areas (Whitaker et al. 1977, 1981a, Johnson and Cassidy 1997). Occurrence in the West extends from sea level to 3,800 m elevation (Nagorsen and Brigham 1993, Adams 2003). In mountainous areas, males inhabit higher elevations than females (Kurta and Baker 1990, Baker and Lacki 2004). Roosts and roosting behavior. Summer day roosts of this species, including maternity colonies, occur in a variety of settings, including buildings (e.g., inside attics and walls), trees, snags, caves, mines, crevices in cliffs, and bridges (van Zyll de Jong 1985, Hendricks et al. 2005, WBWG 2005, NatureServe 2009). Reproductive females are colonial and occupy sites offering suitable temperature gradients. Maternity roosts are often in older buildings having appropriate entry points (Williams and Brittingham 1997, Neubaum et al. 2007) or in large live or dead trees in intermediate stages of decay (Brigham 1991, Betts 1996, Vonhof 1996, Kalcounis and Brigham 1998, Willis et al. 2006a, Rancourt et al. 2007, Vonhof and Gwilliam 2007, Arnett and Hayes 2009). Occupation of trees and snags depends on the presence of cavities, hollow trunks, crevices, loose exfoliating bark, and dead or broken tops; cavity volume; openness from surrounding vegetation; and older age of the forest stand. Ponderosa pine, aspen, and Douglas-fir are among the main tree species used for roosting (Brigham 1991, Betts 1996, Kalcounis and Brigham 1998, Rabe et al. 1998a, Rancourt et al. 2007, Vonhof and Gwilliam 2007, Arnett and Hayes 2009). Maternity roosts in the West usually contain anywhere from about a dozen to several hundred individuals (WBWG 2005), but in other regions, females sometimes roost in smaller groups or alone (Lausen and Barclay 2002). Maternity colonies in trees are reportedly larger than those in buildings in British Columbia (Nagorsen and Brigham 1993), but it’s unclear whether this pattern applies elsewhere in the West. Buildings offer greater safety from predators and warm microclimates, resulting in earlier births, faster juvenile growth, and increased energy savings, and therefore are probably preferred as roosts over some types of natural sites (Lausen and Barclay 2006). Most adult females return to the same maternity roost or roost area in successive years. Pregnant and nursing females also demonstrate strong daily fidelity to roosts in permanent structures such as buildings, whereas those roosting in trees and erodible cliffs commonly switch roosts every few days or less (Brigham 1991, Betts 1996, Kalcounis and Brigham 1998, Lausen and Barclay 2002, Willis and Brigham 2004, Rancourt et al. 2007, Arnett and Hayes 2009). Forest- and cliff- dwelling females form fission-fusion societies composed of a number of groups spread among multiple cavities at any one time (Lausen and Barclay 2002, Willis and Brigham 2004). As a whole, the bats are too numerous to live in a single cavity, but individuals remain loyal to an area of forest and over time roost with most colony mates in other trees. Non-reproductive females may or may not roost within maternity colonies (Hamilton and Barclay 1994, Lausen and Barclay 2006). Maternity colonies begin to break up in August (Barbour and Davis 1969). Both reproductive and non-reproductive females regularly use torpor while day roosting during summer (Hamilton and Barclay 1994, Lausen and Barclay 2003). Adult males use buildings, trees, and rock crevices as summer day roosts. At Moses Coulee, males roosted only in basalt cliffs (Rosier and Rosenberg 2006). Males usually roost singly or in small groups, but sometimes join maternity colonies (Kurta and Baker 1990, Hamilton and Barclay 1994, Adams 2003). Some males (e.g., those inhabiting rock crevices) frequently switch roosts (Brigham 1991). Males use torpor more often and enter it more deeply than reproductive females (Hamilton and Barclay 1994). Bridges are regularly used for night roosting in Oregon, California, and probably Washington (Pierson et al. 1996, Adam and Hayes 2000; M. MacDonald, pers. comm.). Bridge roosts are mostly occupied by solitary males or mother-young pairs, but aggregations of more than 75 animals have been noted (Pierson et al. 1996). Basalt cliffs are also used (Rosier and Rosenberg 2006). Hibernacula include buildings, caves, mines, and rock crevices (Kurta and Baker 1990, Neubaum et al. 2006), but the extent that other natural sites (e.g., hollow trees) are used is poorly known. Buildings are considered the most important hibernacula in western Canada and western Oregon (Nagorsen and Brigham 1993, Maser 1998). Relatively little is known about hibernation sites in Washington, but buildings are known to be used (Perkins et al. 1990). Hibernacula generally have air temperatures of 0-18°C (32-64°F) (Barbour and Davis 1969, Brack and Twente 1985, Whitaker and Gummer 1992, Neubaum et al. 2006). Some winter sites also function as maternity roosts in summer (Whitaker and Gummer 1992, 2000). Swarming behavior occurs at mines and caves before hibernation (Nagorsen and Brigham 1993). Hibernation lasts from November to April in interior British Columbia (Nagorsen and Brigham 1993). Hibernacula rarely hold more than a few hundred individuals (NatureServe 2009), with those present usually roosting alone or in small clusters of fewer than 20 animals (van Zyll de Jong 1985, Kurta and Baker 1990, Whitaker and Gummer 1992). Both sexes hibernate together (Whitaker and Gummer 2000). Individuals may lose 25% of their pre- hibernation body weight over winter (Nagorsen and Brigham 1993), thus failure to accumulate sufficient fat reserves can be a major mortality factor, particularly for juveniles. Movement among hibernacula is common within a winter (Boyles et al. 2006). Reproduction. Adult males have descended testes beginning in mid-July (Baker and Lacki 2004). Mating likely occurs in the fall and occasionally during winter arousals from hibernation (Kurta and Baker 1990). Sperm remain in the uterus over winter, with ovulation and fertilization occurring in spring after hibernation ends (Wimsatt 1944). Pregnancy lasts about 60 days (Kurta and Baker 1990). Births occur from May to August (Barbour and Davis 1969, Adams 2003, Baker and Lacki 2004), but dates can vary within and among roosts probably due to annual differences in weather (Nagorsen and Brigham 1993). Most births in British Columbia and western Oregon occur in June or early July (Nagorsen and Brigham 1993, Holroyd et al. 1994, Maser 1998), but pregnancies have been recorded as late as 12 August in Washington (Baker and Lacki 2004). Litter size is usually one young in western North America (Barbour and Davis 1969, O’Shea et al. 2010). Lactation lasts 32-40 days (Kunz 1974). Juveniles begin to fly at 18-35 days (Kurta and Baker 1990). In Washington, Baker and Lacki (2004) began seeing flying young by 12 August. Males attain sexual maturity in their first fall, but only 50-75% of females do so (Christian 1956, Schowalter and Gunson 1979, O’Shea et al. 2010). Survival rates are lower in juveniles than in adults (O’Shea et al. 2010, 2011). Food habits and foraging. The large powerful jaw musculature and heavy teeth of big brown bats allow them to feed on hard-bodied insects as well as other prey (Freeman 1981). Beetles typically form the bulk of the diet (Brigham and Saunders 1990, Kurta and Baker 1990, Whitaker 1995, Hamilton and Barclay 1998, Moosman et al. 2012). Several studies from western and eastern Oregon and Idaho support the preference for beetles, with 34-53% of the diet comprised of these insects (Whitaker et al. 1977, 1981a, Lacki et al. 2007b, Ober and Hayes 2008a). Moths, termites, true bugs, leafhoppers, flies, and flying ants are other main foods. Other regional studies have found preferences for caddisflies (Brigham 1990, Verts et al. 1999), bees, and ants (Henny et al. 1982). Big brown bats usually emerge from day roosts between sunset and darkness (Whitaker et al. 1977, Kurta and Baker 1990) and may initially forage in large circles high above the ground, but soon descend to feed within 15 m (50 ft) of the ground (Whitaker et al. 1977, Kurta and Baker 1990, Brigham 1990). Flight is strong, direct, and moderately fast (van Zyll de Jong 1985). Several foraging flights are made per night and are interspersed with visits to night roosts. Foraging individuals have been documented traveling up to 10 km from their days roosts (Kurta and Baker 1990, Brigham 1991, Rosier and Rosenberg 2006), with males using larger foraging areas (average = 5 km2) than females (average = 2.7 km2) (Wilkinson and Barclay 1997). 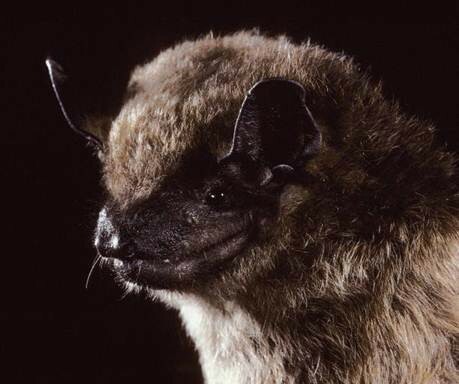 In the Pacific Northwest, big brown bats forage above the forest canopy; along forest and rural roads, forest edges, and cliffs; over clearings and water courses; and in urban areas. In forest, individuals forage among and over the tops of trees rather than under the canopy (van Zyll de Jong 1985). Seasonal movements. Most big brown bats travel less than 90 km from summer roosts to hibernacula (Mills et al. 1975, Neubaum et al. 2006). Winter specimen records from the Pacific Northwest (Perkins et al. 1990, Nagorsen et al. 1993) suggest the possibility that many individuals remain close to their summer range. Threats. Major large-scale threats are not known, but localized populations can be affected by one or more concerns (Agosta 2002, WBWG 2005, NatureServe 2009). Logging probably causes the loss of roost trees. Roost disturbance and destruction can be harmful, particularly exclusion and eradication in buildings, closures of mine, and cave and mine visitation by people. Increased urbanization, grazing, and loss of riparian habitat can reduce foraging habitat. Big brown bats are vulnerable to pesticides, which can cause mortality, alter behavior, and be transferred to nursing young. Mortality from white-nose syndrome is another threat. Conservation measures. Protection of maternity roosts and sizeable hibernacula is a priority for conservation. For tree-dwelling populations, retention and recruitment of large snags, decadent trees, and hollow trees is important (Hayes 2003, Willis and Brigham 2004, Vonhof and Gwilliam 2007, Arnett and Hayes 2009). On intensively managed forests, management agreements and incentives for protecting large-diameter roost trees are desirable (Hayes 2003). Maintaining remnant patches of structurally diverse forest with abundant large snags is another protective strategy (Waldien et al. 2000). Providing roost structures within 2-3 km of open water or riparian areas is probably beneficial by providing ready access to drinking and foraging sites (Hayes 2003). Maintaining potential roosts across a variety of topographical positions is also desirable so that bats have a range of suitable roosting sites to select from. Where eviction from buildings is necessary, appropriate actions should be taken to minimize negative impacts to the bats. Precautions to reduce disturbance should be taken when mine and cave surveys are conducted during the breeding season and winter hibernation. Seasonal inventories of bat use should be conducted at mines and caves considered for closure, with bat gates installed where occupancy is documented.